Twenty-year-old Jesse Morgan has always been a dreamer, the valiant hero in many an imaginary tale. But when a real-life act of bravery appears to result in tragedy, Jesse flees the tenements of New York's lower east side for a life of anonymity across the Great Plains. Little does he realize that he is being followed. 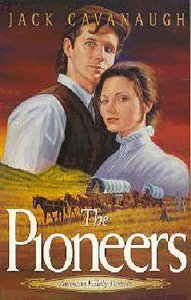 His pursuers are Emily Austin, who knows the truth about the mishap and who also secretly desires to be Mrs. Jesse Morgan; Clara Morgan, Jesse's sole surviving parent, who risks the dangers of the untamed prairie to find her only son; and Richard Tykas, an unsavory detective, who knows that when he finds Jesse he will find his real prey--Emily Austin. But in hottest pursuit is God, whom Jesse has struggled to trust since a long-ago factory fire robbed him of his father--and his childlike faith. From the crime-infested streets of 1890s New York to the boisterous frontier town of Denver, join the chase for Jesse Morgan in this fifth book of "An American Family Portrait." About "The Pioneers (#05 in American Family Portrait Series)"